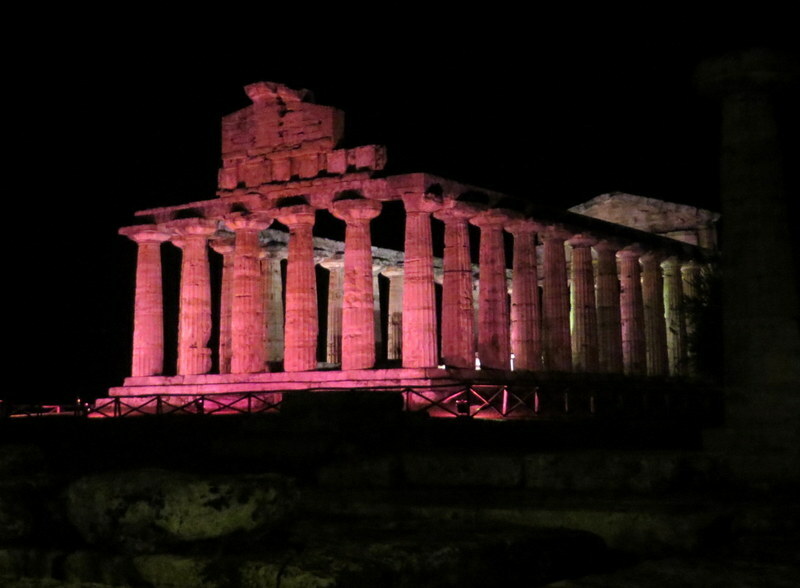 …so we went to Paestum. Very old Greek temples, still standing. One is from 550 B.C! Amazing! Inexpensive lodging at a rather delightful little place. Euro 73.00 per night including an Italian-style breakfast. An excellent — who’d have guessed it?– restaurant right next door to our hotel. Truly a fine meal, nice people, very raffinato (refined, elegant). In fact, we will return this evening. And they give a discount for people staying at our hotel. There is a nice museum with well-preserved artifacts. It was not crowded and the weather was darn-near perfect. It takes a long time to get here. 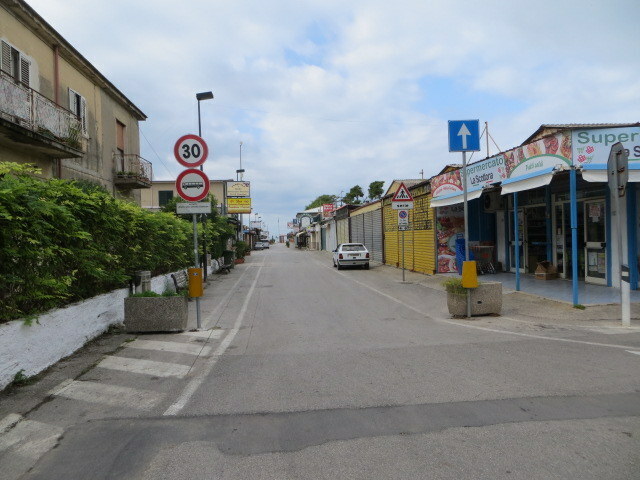 From Roma, door-to-door took us 7 hours including 2 buses, 1 Metro, a Frecciarossa, a Regionale and a 20-minute walk. There was a fair amount of waiting time, partly due to guasto (malfunction) on the rail line. We also got to had to stand up all the way on the Regionale. 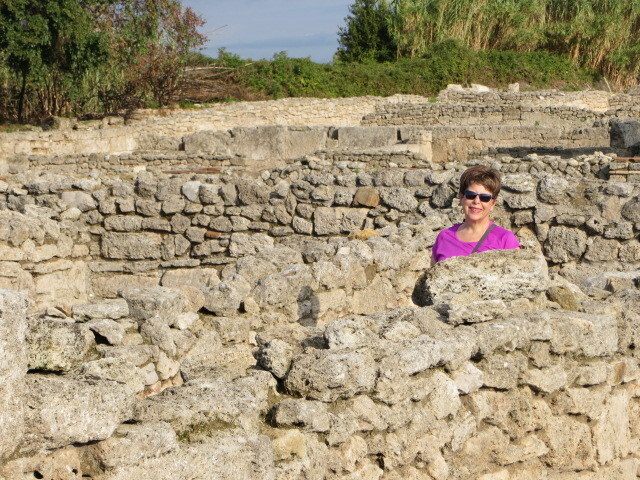 There’s the archeological site, the museum, and that’s about it in Paestum. There’s the mare, but the seaside here made the town of Seaside, Oregon (not my favorite place) look like a high-class resort. We stayed one night too long, it seems. A few hearty souls at the beach. In summer no doubt it is crowded. 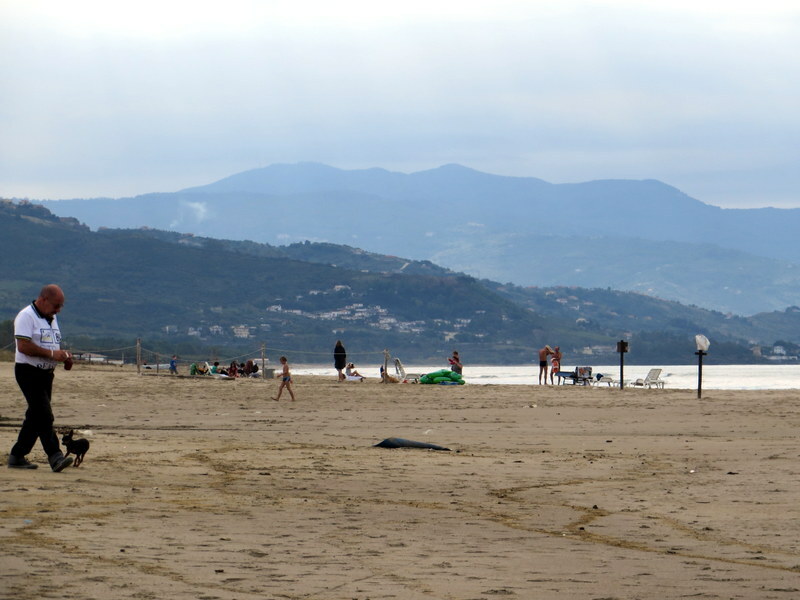 Sad little seaside Paestum. I am sure it is lively in the summer, but I suspect it still feels sad. We seldom go anywhere for one night. In fact, the only place I can think of that we did that was in Tivoli for the summer lights one August. And Tivoli is a hell-of-a-lot easier to get to than Paestum. 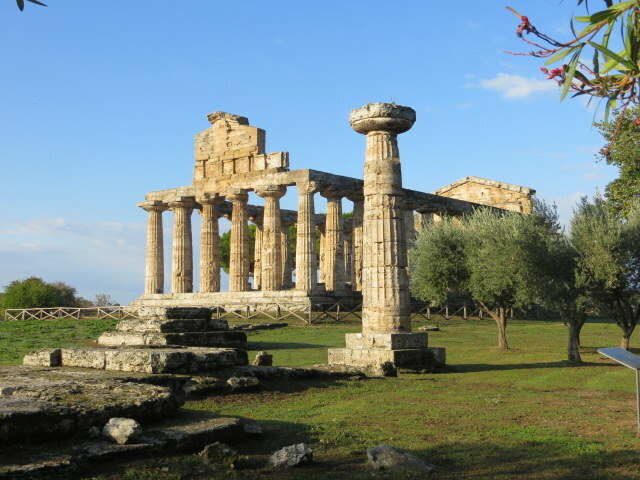 We have also seen the impressive Greek temple and ruins in Segesta. Perhaps if one has not seen those, this would knock your socks off. My socks are still on. We did get to be the first people in the archeological site, which was pretty fun. The tour groups showed up about 10:00 as we were exiting looking for an espresso. 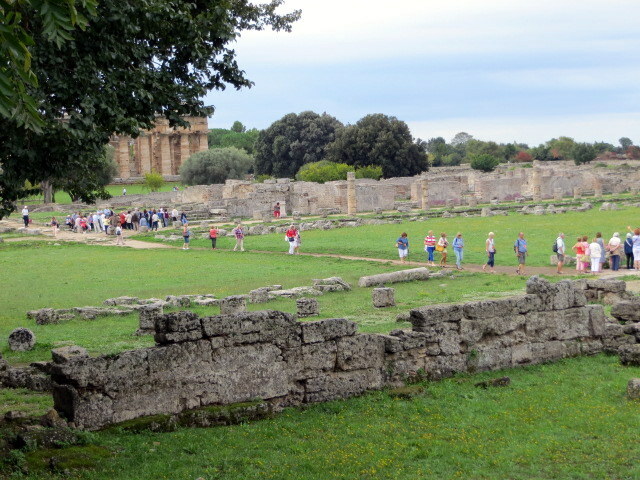 A tour group passes through the archeological site. Maybe I am also jaded by the dead kitten I saw along one road and the dead rat along another. I have not had the misfortune to see roadkill in all of our travels. This in contrast to meticulous care to remove trash in the ruins. Temples are lighted at night. 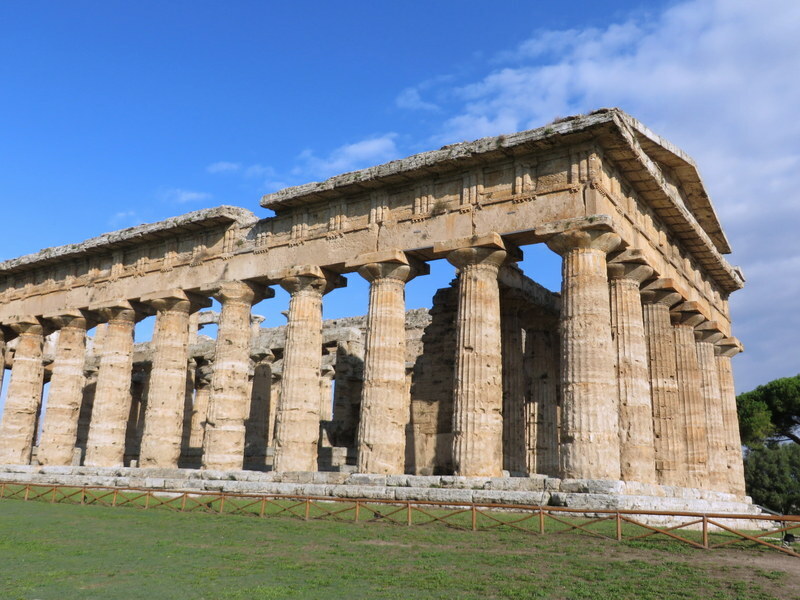 If one were to want to see Paestum (and I understand why it would still be a draw despite my commentary), I would recommend a day trip from the Amalfi Coast or a one-night stay. The nice thing about staying a night is getting to see the temples lighted, and also seeing the site in both morning and afternoon light. We are not people who read every display in a museum or poke into every corner of a site. (Three hours at Pompeii was plenty for us.) 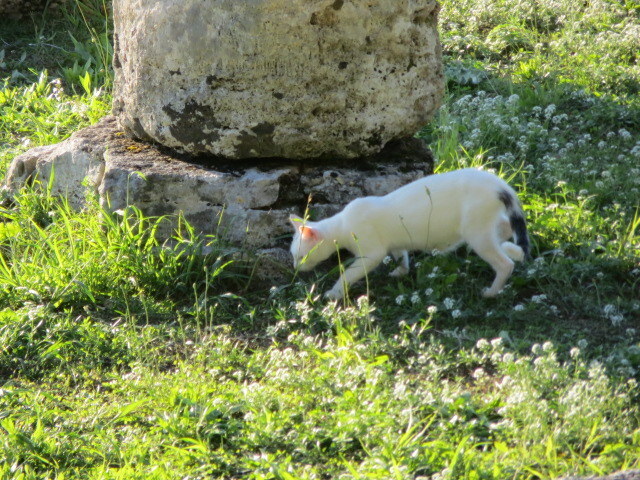 If one does like to explore a bit more, perhaps Paestum would warrant more attention. We are happy we came, but a little bored as I write this. I am very happy we did not divert a vacation day-or-two when we were working. But we have time now. Surveying work in progress. Only about 30% of the site has been excavated. Of course, there were ferals around. 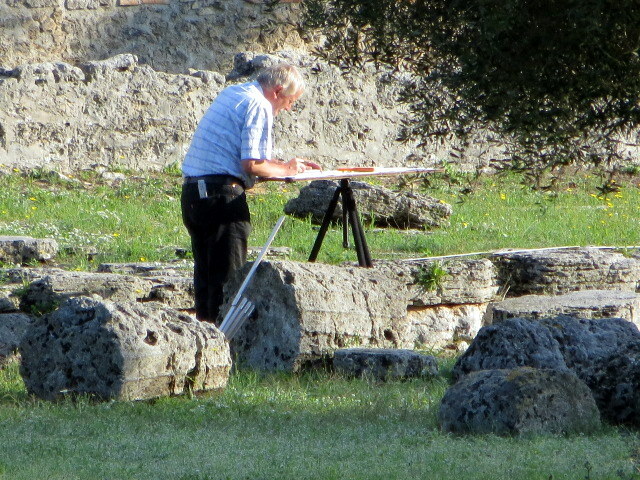 A bright spot in the Roman ruins. Only the temples are Greek. The surrounding ruins date “only” to Roman times. 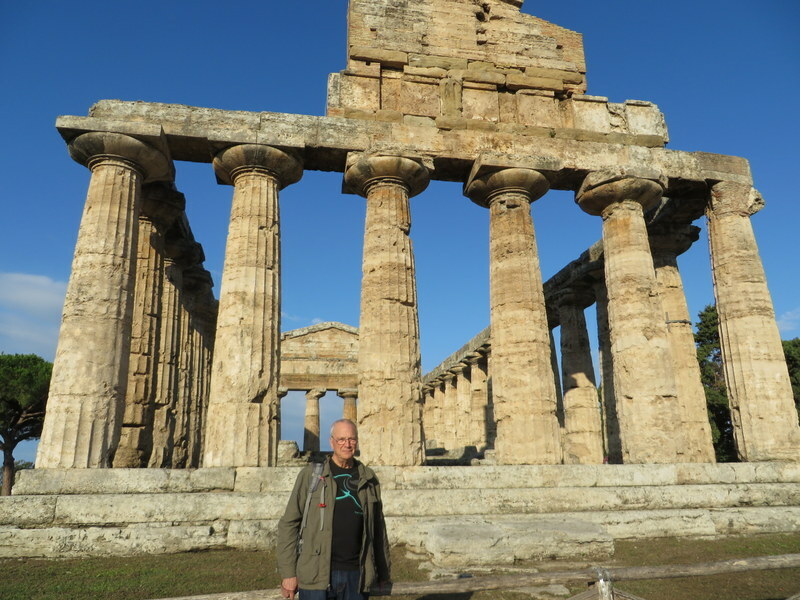 Ric at Temple of Ceres. 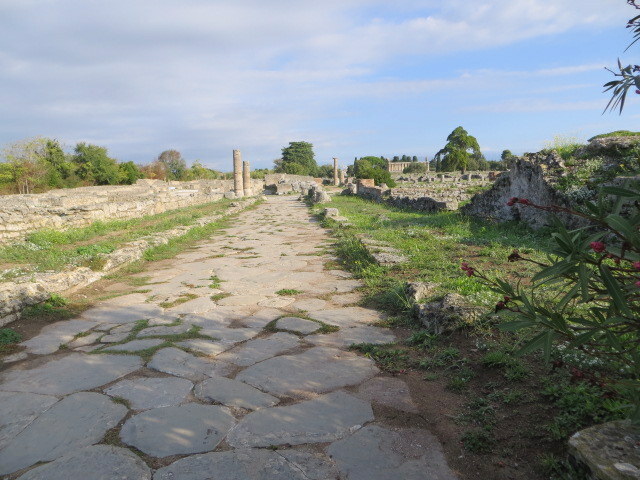 Old Roman road to the sea, which was once much closer. It’s now about a 20-minute walk via modern road. When it is hot, Italy comes alive at night. The number of people dining at 10:00PM or later even on a week night is amazing. People take their lives out-of-doors once the sun goes down. Although this summer has not been as miserably hot as the past two (2012 was one for the record books), it’s still humid and hard to move around in full sun. The nights are soft and pleasant, and there is a tradition of special events and the opening of venues that normally close at 6:00PM. Notte d’Estate a Castel Sant’Angelo, Lungo Il Tevere Roma (a festival along the Tiber), and various other events dot the calendar in Rome. 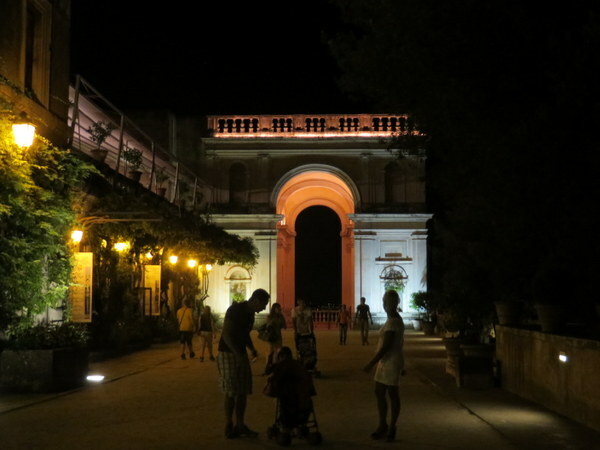 Last summer we tried to go to Tivoli to see the magnificent Villa d’Este lighted at night. It was a bust because we were driving, directional signs were poor, and we didn’t know what we were looking for. We did find on that first visit that Tivoli is very lively on summer evenings. So during the past year we made two daytrips to Villa d’Este via train to get our bearings. Finding it remarkable, we decided to spend a night at a B&B and see the gardens by night. 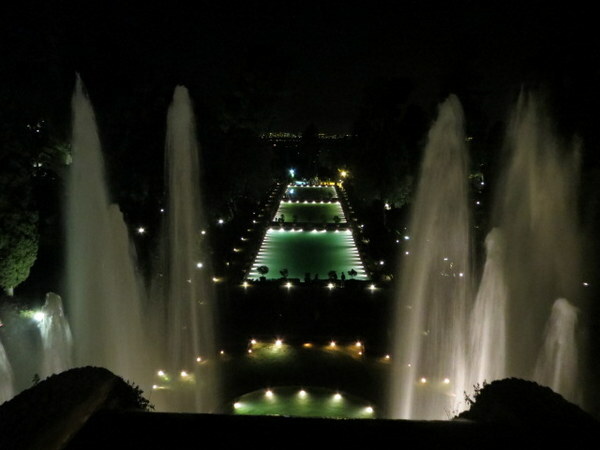 Every Friday and Saturday through September 13 (weather permitting), Villa D’Este opens its gates after dark allowing one to enjoy its magnificent fountains illuminated. The transformation at night is stunning. We boarded a regionale train from Station Tiburtina on the holiday of Ferragosto (August 15), and checked into the charming B&B al Palazzetto, a recently restored 15th century building. The proprietor is an architect and his professionalism showed in the fine design. We were warmly welcomed and shown to a comfortable room with one of the most modern bathrooms we have had in Italy. The town of Tivoli offers many fine restaurants, and it seems they are open very late to serve those who choose to tour Villa d’Este before dining. We chose one with a fine location on a piazza, Taverna Quintilia, only a few minutes’ walk from the entrance to Villa d’Este. 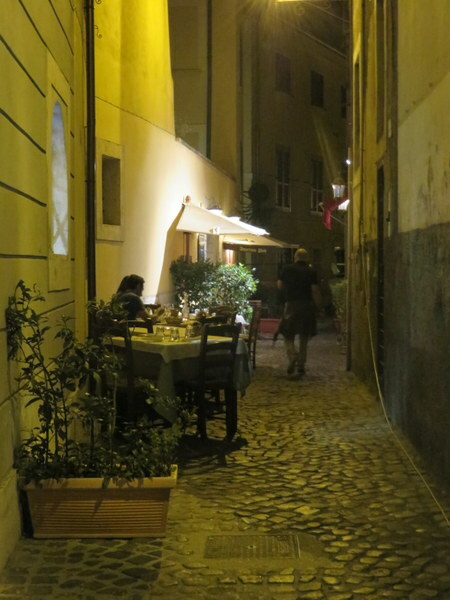 Taverna Quintilia is a rarity: a true Neapolitan seafood restaurant in Lazio, featuring succulent octopus, fresh marinated alici (anchovies), grilled spigola (sea bass), and more. This was some of the best seafood we have eaten outside of the Cinque Terre and Sicilia. 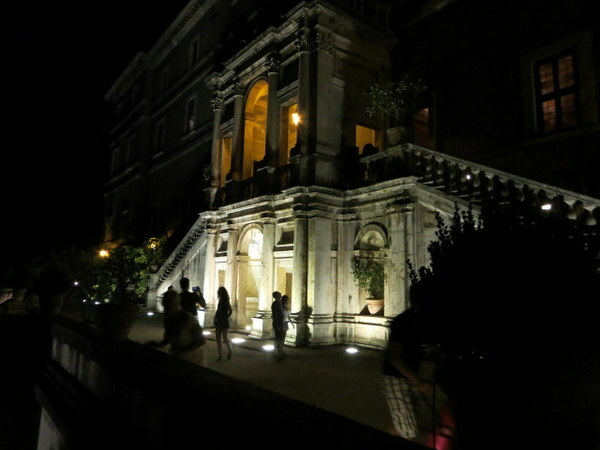 After dinner we headed over to Villa d’Este, arriving about 9:30PM to find a fast-moving line. The estate is huge so it swallowed the crowd easily and we enjoyed an uncrowded tour. The estate is transformed by the play of light on fountains. It occurred to us that in the U.S. this place would not be allowed to be open at night: it would be too dangerous with the low lighting, uneven walkways, and dark Renaissance staircases. We firmly held hands and thoroughly enjoyed wandering the grounds, watching the families and couples alike enjoying a soft evening – almost cool for August. The Renaissance-era villa, commissioned by Cardinal Ippolito II d’Este, son of Alfonso I d’Este and Lucrezia Borgia and grandson of Pope Alexander VI. 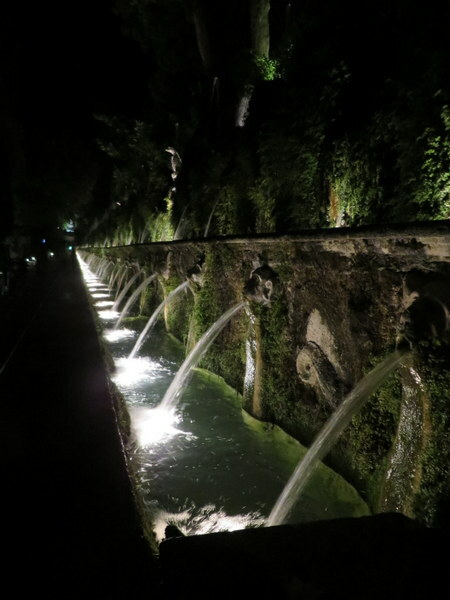 Beautifully lighted fountains – Renaissance era faces carved into a long wall light a romantic walkway. 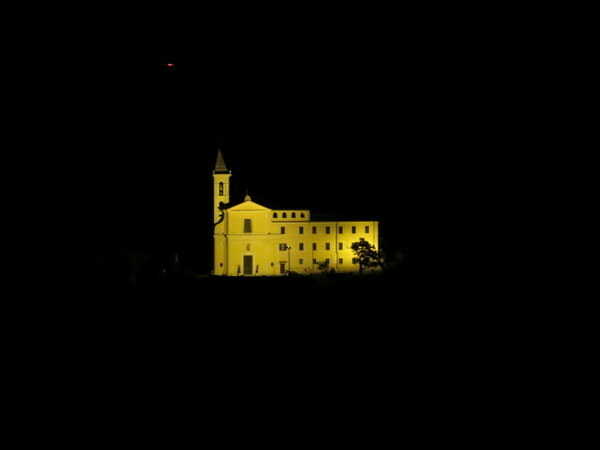 An unidentified church seem s to float in the darkness, just beyond Villa d’Este. Dramatic lighting of architectural features at Villa d’Este.